Now that both the digital flight data recorder (DFDR) and cockpit voice recorder (CVR) from AirAsia 8501 have been recovered from the Java Sea, a picture of the fate of the aircraft is starting to emerge. The Airbus A320 with 162 passengers and crew was enroute from Indonesia to Singapore when it went missing in an area of heavy thunderstorms over the Java Sea. Just prior to the disappearance of the aircraft, a request was made for a climb which was denied by air traffic control. Two pieces of information which have been obtained from the recorders are that the aircraft climbed at a rapid rate and that multiple alarms were sounding in the cockpit including a stall warning. At this point it is still too early to speculate exactly what happened to the aircraft but some pieces of the puzzle are available. Data from the DFDR indicate that the aircraft at some point was climbing at a rate of 6000 feet per minute (FPM) which is considered excessive. This is generally true, especially for a fully loaded aircraft at altitude. A modern transport aircraft actually can achieve such a climb rate under normal circumstances when it is lightweight and closer to the ground, but certainly couldn't sustain such a climb rate without quickly bleeding off airspeed. The question yet to be answered is whether the climb was initiated by the pilot as an emergency measure to avoid a looming storm cell, or rather caused by the aircraft inadvertently entering a storm and being buffeted by the strong updrafts in the cell. Or perhaps it was a combination of both storm action and pilot input. A rapid climb for whatever reason appears to have caused the loss of airspeed to a point below the stall speed for the aircraft, which would explain the stall warning being heard on the CVR. Investigators will need to correlate the position of the aircraft at that time with radar and satellite imagery to determine if the aircraft was actually in a storm cell. Acceleration data from the DFDR will also help determine if the aircraft was experiencing high G forces or severe turbulence which would indicate whether it had entered a storm cell. I don't know if the DFDR on the A320 records imagery from the aircraft's airborne radar, but if it does it will be helpful. If the rapid climb was initiated by the pilot, another question that needs to be asked is why did he choose to climb as opposed to turning to avoid the storm? A common misconception among the public concerning storms is that aircraft can simply climb over them. There is some truth to this. As with most things in aviation, the answer to this question is it depends. Storms come in many shapes and sizes and smaller ones can be topped. The biggest ones however can easily exceed 40,000 ft and should be deviated around and not over. Even should a storm not exceed the altitude capability of an airliner, (about 41,000 ft for most) it's not a good idea to try to top the larger ones as turbulence can exist well above the actual storm cell. Larger storms with strong updrafts can even eject hail out of the top which can then travel for many miles. Hail will ruin your day. Presumably, the captain of 8501 knew all this. One possible scenario might have been if they had been searching for a hole in the storms to fly through which then closed in front of them, or they flew into a radar shadow and were confronted with an unseen storm. In this case choices are limited. The turn radius of an airliner at altitude can be five miles or more depending on speed. If the crew needed to immediately avoid a storm cell but were too close, climbing is the only option. You may not top the storm but it might be less turbulent higher up. Ideally, this is a situation to be avoided by early planning for storm avoidance. What is a Stall Anyway? I'm going a bit down the rabbit hole here but please bear with me. For the math-phobic, this equation means that as the velocity of a fluid increases, its pressure decreases. As applied to an airplane wing, the air (a fluid) travelling over the top of the wing must travel faster than the air travelling beneath. The faster moving air above the wing then has a lower pressure than the slower moving air beneath and hence lift is generated. There is one caveat to this process and it's a biggie. Lift is only generated when the airflow over the top of the wing remains laminar meaning smooth. Should the airflow become turbulent, the relationship no longer exists and lift is destroyed. This is known as boundary layer separation and is the technical definition of a stall. A stall will happen when the airflow over the wing is too slow to generate enough lift to support the weight of the aircraft. When this happens the boundary layer separates, the laminar flow is disrupted by turbulent flow, lift is destroyed and the airplane drops like a stone. You may have noticed tiny fins and tabs attached to the top of the wing on an airliner. They are there to facilitate laminar flow. Look for them next time. It sounds scary but it really isn't. Stalls need not be feared but they should be respected. Once in a stall, every pilot should know how to get out of it. The first step is recognition. A stall may feel very similar to turbulence but a glance at the airspeed indicator will be an immediate tell. All airline pilots routinely practice stall recovery in the simulator and as an instructor pilot I personally stalled or had my students stall and recover a real airplane on a daily basis for years. It's a basic aviation skill. So getting back to AirAsia, why would the pilot climb at such a high rate of vertical speed knowing that there was a possibility of stalling the aircraft? He was possibly trading his available energy for altitude in hopes of avoiding a storm cell. A major component of flying airplanes is what is known as energy management. This means being aware of and managing the aircraft's mix of potential and kinetic energy. Anyone who has ever ridden a roller coaster or perhaps played with Hotwheels cars and track will understand. As a roller coaster tops the first big hill, kinetic energy is low (in speed) yet the potential energy stored (in height above the ground) is high. This situation is reversed at the bottom of the hill with high speed thrills and then reversed again at the top of the next hill. Trading speed for altitude can also be done in an aircraft. Only unlike a roller coaster, an airplane has to maintain a speed above stall speed to stay airborne. The energy available to trade is expressed in the difference between current airspeed and stall speed. This type of energy tradeoff is also done routinely in airline operations. Say for instance we're cruising along at 280 kts and are given instructions to climb. Air traffic control may also ask for an expedited climb for converging traffic or some similar reason. Advancing the engines to climb thrust and climbing at 280 kts is the normal climb profile, but by also pulling the nose up somewhat more and letting the speed bleed off to say 250 kts, the airplane will climb quite smartly, trading the energy in that extra 30 knots of airspeed for a higher vertical velocity. Then once level, you accelerate back to your original 280 kts in level flight. If an assumption is made that the captain climbed rapidly by trading his airspeed for altitude but then unsuccessfully avoided a storm cell, the situation might be potentially worse than entering the storm with lots of airspeed. Once available airspeed is traded for altitude, the aircraft is closer to stalling and the gusts found inside a storm can easily cause the airspeed to fall below stall speed. Once stalled, control of the aircraft can also be compromised by gusts preventing a successful stall recovery. In the case of Air France 447, the pilots never recognized that they were in a stalled condition and never applied the correct recovery procedures. 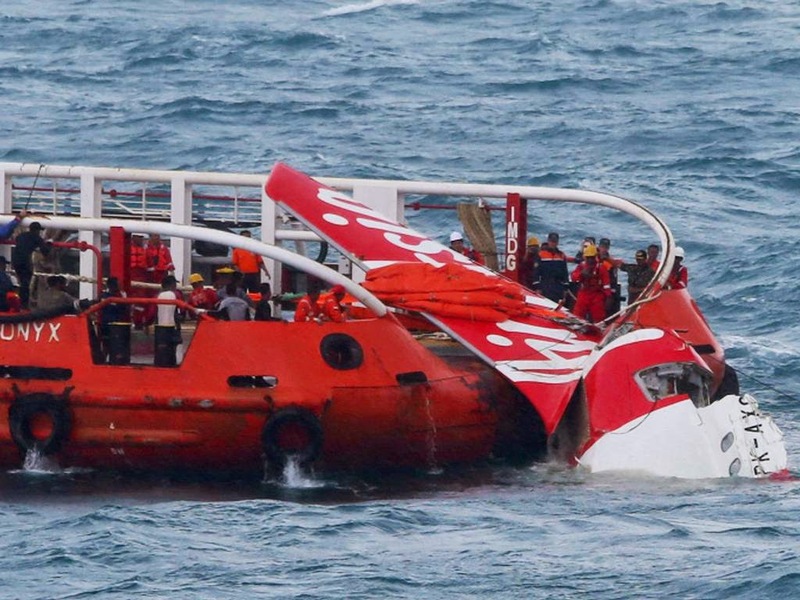 What happened in the AirAsia cockpit is as yet unknown or unrevealed, and the situation may well have been unrecoverable by any method. Concern for the families of the deceased and other political considerations may impact the timing and method of the release of more information. Hopefully further analysis of the DFDR and CVR will eventually reveal the actual events surrounding the fate of QZ8501.